Last week was a helluva week for those of us helping people without a place to live. Today, July 4th at 1 PM, SDPD announced they are searching for a suspect in the assault and murders of homeless men. One body was burned under the Clairemont Drive freeway ramp. Another was found in a park near Ocean Beach. In recent weeks, additional attacks have taken place downtown near Horton Plaza and other areas. It is time to end the #SDPD #ASG sweeps to prepare for the All Star Game and ComicCon. 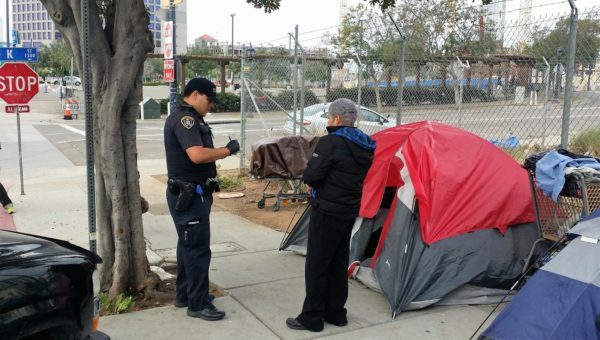 These sweeps are not only NOT promoting safety, they are actually putting people’s lives at risk as they seek shelter by hiding and sleeping in other areas, away from lighting and people who might deter these attacks.